The United States of America was established with lofty moral goals and noble purpose; it was believed that a government based on these ethical principles was the proper way to realize liberty and freedom. As the country continues to grow, from the days of the colonies to the influential nation that it is today, the governmental structure has grown and developed along with it into a unique type of government that profoundly affects the lives of the American people. Power in the People presents a detailed analysis of not only the origins of democracy, development and operation of government, and evolution of the country, but also a penetrating look into the character and purpose of the republic. 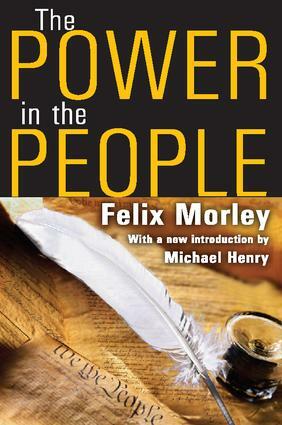 Morley focuses on the founding of American freedom in the conviction that the individual is fully capable of self-government, and therefore power must be dispersed as much as possible among the individual citizens who generate public order from the internal order of their own souls. The power in the people is precisely that of self-government, which minimizes the need for state power, and the self-government is necessarily under the authority of God. The dream of building a commonwealth more gracious than any that had gone before was ever in the minds of the founding fathers and reflected in their act of placing great power in the hands of the citizens. Michael Henry's new introduction to this classic book places the work into the context of contemporary society, most poignantly noting that America, by Morley's standards, has not been vigilant enough in preserving its historic greatness or freedom.